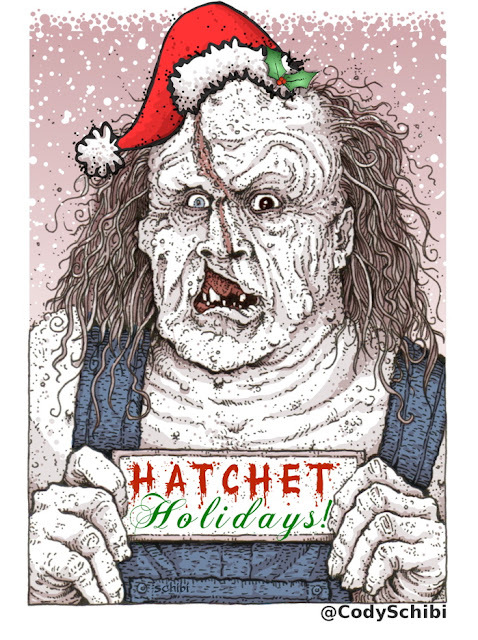 Drawing A Blank: The Art of Cody Schibi: Holiday Fear! Here to help spread Holiday Fear...I mean CHEER is a quickly modified version of one of my 'Monster MugShots'! I give you "Christmas Crowley". Put it on a card & send it over to Grandma! Hope you guys & gals have an awesome, safe Holiday!...& you will...if you STAY OUT OF THE DAMN SWAMP! *The creator of Victor Crowley (Adam Green) himself has been spreading this image via Twitter, Facebook & on his website. Coolio! It's A SALE 13ig 13oys! !